PRODUCT: 10 inch Black Polyethylene Drain Dome / Strainer/ Grate. 9-1/2 OD Base X 4-1/4 High with 3 Bolt Mounting Holes. Replaces Popular 10 Inch Plastic Strainers / Domes. Price/Each. 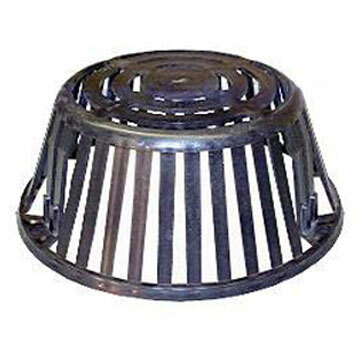 Replaces 10" Plastic Drain Strainer / Grates. Fits Most Popular 10" 3-Bolt Drains.